From planting to field care, harvesting and creation of our line of lavender items, our farm takes great pride in our unique lavender products for body, garden, gifts, home and weddings. Our farm fresh lavender products are hand made one-by-one, using fresh-from-nature ingredients, sourced locally, when possible. Many items are truly one-of-a-kind, offered at farm-sponsored events and in our online shop. Lavender’s claim to fame is its soothing, calming qualities. 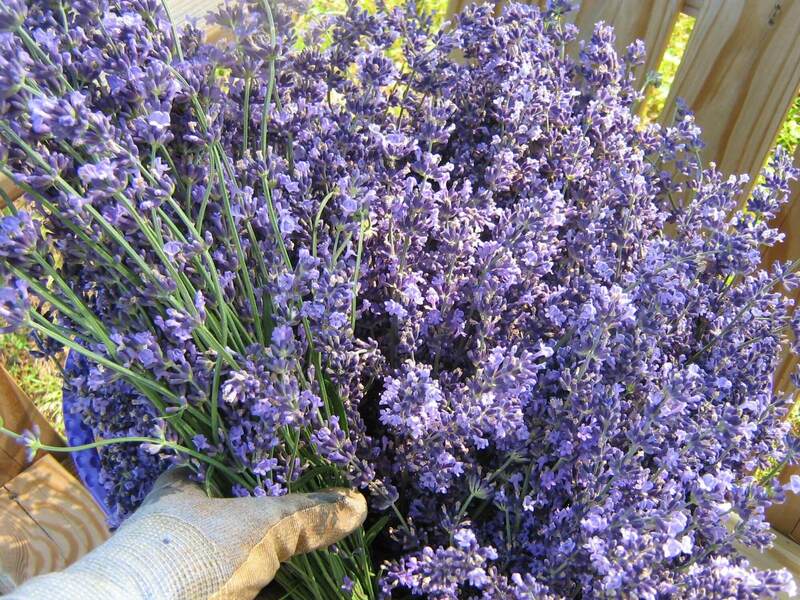 Lavender relieves stress naturally, eases headaches and is most often recognized in bath and body products. Place fresh or dried lavender into a muslin bag or tea ball. Steep the flowers in your bath water and enjoy the soothing fragrance released by the heat and steam for a relaxing soak. Lavender symbolizes devotion, joy, and luck, so nice to share. Many farm patrons love shopping for gifts throughout the year and especially enjoy discovering one-of-a-kind items at on-farm Celebrations in June and December. To learn more about these events and others throughout the year, sign up for our Lavender Letters at sunshinelavenderfarm.com. Lavender in the garden repels moles, flies, and mosquitoes, and luckily, deer do not care for it. Lavender planted near roses, annuals, vegetables or other “deer candy” will deter them. Lavender plants are offered to home gardeners at events in the spring and fall with hands-on planting clinics to demonstrate how to garden with lavender successfully. Lavender Plants • Offering varieties that perform well in North Carolina and other humid locations with planting tips and the know-how to care for them in your garden. Lavender has a clean, fresh scent, so wonderful to use every day. Did you know that lavender can be exchanged for rosemary in favorite recipes? An award-winning chef mentioned this culinary tip years ago and it has proven itself time and again. Looking for recipes? We’ve gathered our favorites over on our Pinterest page!